Are you looking for the best long range scope on a budget? Getting a quality long range scope with limited spending cash can be a difficult task. We’ve done the research and have put together a list of 5 long range scopes that will be suitable for different budget levels. Read this review and you’ll be able to find a scope to call your own. Everyone’s definition of a budget is a little different. A long-range budget scope for Joe might be something under $300 while for Jim his ideal price range is around $150. Don’t get too worried about what your price range or budget is because we’ve put together a top 5 list that ranges from less than $100 during sales and roughly around $300 at full price. Since scopes come with a range of features and each of these features can impact the price of your scope which ones do you try to keep and which ones do you allow to go? This is probably the biggest determining factor when choosing a affordable scope. We’ll cover some of the features you should consider keeping and others you can let slack in order to get a good scope within your price range. One of the biggest factors of your scope will be its ability to hold zero. With long range rifle scopes, the ability to hold zero becomes more important the further out your target is. When you’re shooting at a distance and your zero is off it becomes magnified the further your bullet must travel. So while you can test the scope at 50-100 yards and it seems just fine make sure to it holds up at greater distances. Doing this is more important with lower priced scopes. Some of these scopes can have what’s called a wandering zero. This is where no matter what you do to align and hold zero it always seems to remain off. It’ll move off zero just about no matter what you do and it’s extremely annoying to deal with. This can be caused by faulty scopes or many other factors. That’s where some argue it’s best to stick to name brand scopes. 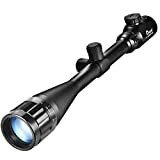 Long range scopes we’ve listed from name brands such as Vortex or Bushnell come backed by these large companies. They provide a better customer experience and if you get a faulty scope you’re more likely to have the issues resolved. Vortex is known for having one of the best warranties in the entire industry. The final thing to consider for holding zero is a scope rated for the caliber you’re going to be shooting. If you place your scope on a higher caliber rifle that the scope isn’t rated for it can damage the internals of your scope. Image clarity is the next big difference that changes with the price of your scope. Always look for a scope that can provide a crystal clear image at long range. This is important for being able to make out small details on your target. It could be the difference between shooting game that’s in season and shooting one that isn’t. We often refer to clarity by the type of glass the scope is using. There are some extremely high-end glass manufacturers out there but this high-end glass isn’t required to have good clarity. It’s just going to take a little more research to find a scope using good glass that’s in your budget. If you’re buying online always check the customer reviews for what owners of the scope say about clarity. You’ll often come across images through the scope that’ll help you make a decision. Remember that when they’re taking images with their phone through the scope it’ll be lower quality but you can still get an accurate assessment. If you’re at a brick and mortar store ask and see if they’ll allow you to take the scope outside or at least aim it through the window at a longer distance. If you’re able to take 2 scopes of varying price points you’ll be able to notice the difference in clarity. As for the reticle, it helps to have a thin reticle that isn’t lit up. Thicker reticles can cover more of the target at long distances and a thin reticle gives you more of the total picture. The consistency of your turrets for adjustments is important. A common recommendation for long range scopes is a 50-100 MOA for adjustments. You want to be able to rely on these adjustments at all times. If you’re unable to rely on the turret it’s going to make finding the right adjustment a headache each and every time. With long range scopes with higher magnification, this issue only becomes amplified. There are two options you should consider skipping if it’ll help you find a more budget-friendly scope. These options are illuminated reticles and high-end magnification. Neither of these options is a necessity to have a good long range scope. I know that may sound odd for the high-end magnification but listen. We’re referring to the crazy magnification range on the high end of the market. Going this route can cost you a lot of money and you simply don’t need this type of magnification for the majority of long range shooting and hunting. As for illuminated reticles, it’s definitely a personal preference to use them or not. Usually, these reticles stick to the tactical market but some hunters enjoy them on any rifle scope and that’s fine. However, if it’s the difference in saving an extra $25 or so which would you choose? Related Read: Top scope rings for long range shooting. Below you’re going to find our breakdown of each individual scope. All 5 of these scopes would make for great long range optics on your rifle. As we stated earlier that when looking for scopes on a budget that everyone’s budget is different. With that in mind, we’ve put together a list ranging in price so you should be able to find a suitable long range scope. The Vortex Crossfire II is one of the scopes on our list that may be in the top end of someone’s budget. However, it’s hard to go wrong with a Vortex scope. Vortex scopes are backed by a huge VIP unconditional lifetime warranty that will replace your scope in many situations. We’ve done detailed reviews on other Crossfire scopes, you can read our Vortex Crossfire II 4-12×44 review here. These scopes are considered to be excellent in many different aspects. The series is often considered as great introductory scopes and different models excel in different areas but this is a great option for a rifleman looking at long range shooting. We like to make sure you know what real customers of products have to say about them. This is what we’ve been seeing from those customers. One customer has been using this on their 338 Lapua mag out to 1600 yards and would consider this a decent scope that you should use with confidence. They state you could pay for better but they’ve found these to be a great balance of price and quality. We didn’t come across any common ground where customers had something negative to say about this model. A few customers did have the scope arrive with mechanical issues so make sure to inspect your scope thoroughly. However, these were a very small number of cases and with the Vortex warranty, they’ll be resolved. We didn’t come across a common negative feature for this exact model. Buy with confidence. This Bushnell Trophy Xtreme long range scope is the second scope on our list that’s made by a popular name brand company. If you need reassurance and better warranties you likely want to stick with one of these 2 name brand scopes. We like this scope for many reasons. It comes with the Bushnell’s no questions asked warranty just in case it arrived damaged or something happens to your scope. Remember that these warranties are backed by the name brand companies and you’re less likely to have a great experience with warranties from non-branded scopes. This scope uses the 2nd focal plane which is the most popular long range scope design. It allows you to keep a tight lock on your target while zooming in on smaller areas. The clarity even at full 24 power is considered to be excellent from real customers using this scope. We only came across one negative comment about this scope. One customer felt the reticle was a bit thick when zoomed in. Of course, this is a matter of personal opinion but it’s worth noting if you’re someone that finds this an issue in other scopes. Other customers consider this model to rival scopes they’ve come across in the thousand dollar range. Related Read: Review of the Bushnell Banner 3-9×40. Some consider the crosshairs to be too thick. Illuminated Level: 5 Intensity (Red) and 5 Intensity (Green). Reticle Type:Rangefinder Lens Coating: Blue. Length: 15.8" .Weight: 23.0 oz .Battery: CR 2032 x 1 (Included). Package Includes: 1 x 6-24x50mm Scope .1 x Protective Cap Set. 2 x Scope Rings for Weaver/Picatinny Rail. This LED Sniper Rifle Scope is the first on our list that isn’t apart of a major name brand company. Does that mean you shouldn’t give it a look? Definitely not! You can find some heck of a deal on non-brand scopes but it takes a little more poking around to find something you’re going to fall in love with. Luckily for you, we’ve done a lot of the poking around already. This is an illuminated reticle long range scope with both red and green colors available. Each color has 5 different levels of adjustable brightness. So, if you like the scope but don’t want the colors you can tone it down as much as you need. Don’t forget to make sure this scope will fit your scope mount and rifle. It’s a 1″ tube that’s 15.8″ inches in length and weighs 23oz. The length of these long range scopes will affect some people. Especially if you’re attaching them to an AR15 and not something else like a bolt action sniper rifle. 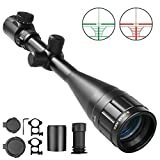 Customers of this scope stated that this scope has all the features of higher end scopes and that it held up well with over 100 rounds fired and stayed zero. The image is sharp from centered field tot he edge under x20. On the downside, the turret adjustments are sub-par at best. The lock rings have to be loosened to make adjustments and then re-locked. The image looks great up to x16 but when you get out to x20 the image degrades quicker. Customers feel it’s a great scope for anything 200 yards or less. The recommendation is if you’re needing to shoot any further than that to consider a different scope. If not you can pick this scope up while it’s on sale and it’ll be a great buy. This is the Feyachi 8-32×50 long range rifle scope that’s considered a tactical scope. It’s an LED optic with dual red and green colors available. This scope is good for both tactical aspects as well as hunting. No one said you can’t hunt with an LED reticle! This scope has an etched glass reticle which is considered to be a more accurate crosshair. It uses the mil-dot features and the colors can be adjusted to different levels of brightness. If you don’t like the colors but like the scope, you can tone it all the way down. 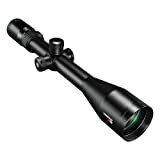 Customers have stated this scope is worth its price and with it being as cheaply priced as it is that it’s pretty good. It’s obvious you shouldn’t expect the same level of overall quality you would find in a $300 scope but this one isn’t too bad. We came across some reviews stating how the scope feels cheap but even so it’s held up better than expected. There was another comment about the clarity when you’re fully zoomed in. It isn’t as clear as a lot of people want but it’s manageable. This is the CVLife 6x24x50 scope. It’s a known brand but isn’t as well known as Vortex or Bushnell. However, they make some really good scopes that you can often find on sale at great prices. This scope is closer to a give you what you need with fewer bells and whistles. Although it does have an illuminated reticle. This scope has some solid features but it doesn’t outperform other high-end scopes at high magnification. This is a common caveat with budget scopes when compared to high-end brands. Don’t let this turn you off from the amount of money you’re going to save while still getting a great scope. During this CVLife scope review, we found that customers are in love with this product. We’ve come across statements such as “wasn’t expecting much… but this scope ended up being very impressive”. Overall it looks like customers have had a good time with this rifle scope and we think you’ll be just as satisfied. The one negative aspect we came across is focused on the zoom. People are saying it isn’t a true x24 zoom when compared to other brands like a Nikon x24. The zoom seems to fall short of what other brands are zooming. The image is slightly less clear but it’s manageable. What does a larger objective lens offer? – You’ll notice there size of a scopes objective lens differs from scope to scope. The benefits of a larger lens are the amount of light it’s able to bring in. It gives you a larger image that with more light is also better quality. However, with a larger objective lens it requires more glass and will increase the final price of your scope and when you’re on a budget that’s one thing to consider. Should I use 1st or 2nd focal plane? – The 2nd focal plane is the most popular option for the best long range rifle scopes. This is where the crosshairs stay the same size and steady when you’re using the scopes zoom. The 1st focal plane scope type is becoming more and more popular and it’s where the crosshair changes in size during the zoom. It really boils down to personal preference or what you’re already accustomed to. Does an LED Reticle help at long range? – Having an LED Reticle for long range shooting doesn’t improve your performance or accuracy. We tend to prefer LED reticles on our tactical rifles but they’re fine for hunting as well. It’s another personal preference and some people just enjoy a lit up reticle. Hopefully, we were able to help you find the best long range scope on a budget. Being on a budget can make things difficult but with a little help, research, and persistence you can find just about anything at a good price. Our 5 picks covered a range of price points that should be suitable for most budgets and these scopes are great long range scopes for the money. If you enjoyed this article you may like reading about affordable muzzleloader rifle scopes.